WHERE DO YOU FIT IN AS AN AFRICAN DESIGNER ? When you start your fashion label one of the most important thing you should think about is : Who am I going to design for ? or as we call it your target market. In recent years there are a lot people who are jumping the wagon of designing just because African print has gained a lot of attention. They don't take into consideration the skills required to be a fashion designer. I began sewing a year ago however that does not qualify me as a designer. What baffles me in the African fashion industry is that anyone who puts 2 pieces of fabrics together is called a fashion designer. If you are someone who is just starting is this business then my question to you is where do you fit in ? Refers to the creation of exclusive custom-fitted clothing. Haute couture is made to order for a specific customer, and it is usually made from high-quality, expensive fabric and sewn with extreme attention to detail and finished by the most experienced and capable seamstresses, often using time-consuming, hand-executed techniques. (Wikipedia). So the other day I was having a discussion on twitter about the use of couture by designers. To be honest I did not know that you had to be chosen by a federation in France to earn the right to call yourself a haute couture designer. I am sure a lot of people don't know either. 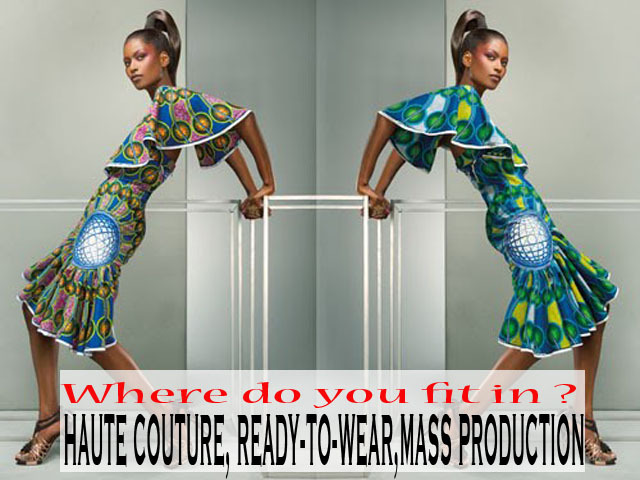 The word couture is being misused by brands all over the place.So far there isn't any African haute couture designer on the list of the federation. I am not sure if I ever refer to an African fashion designer on this site as a haute couture designer but I am sure that will not happen in the future. While making this post I actually visited a few of Ciaafrique's fave designers and on their website the breakdown is as such : Ready- to-wear and Haute Couture. During your career as a designer you might make peices that are close to couture but they are not. So make sure you do not describe yourself as such until you earn the right to do so. In the fashion industry, designers produce ready-to-wear clothing intended to be worn without significant alteration, because clothing made to standard sizes fits most people (Wikipedia). Most designers in Africa or I should say tailors do not use this method. You usually bring your fabric to the tailor and choose your own designs. A lot of haute couture designers also make Ready-to-wear lines because its easier to make profit. Usually when a designer show its ready-to- wear collection at a fashion show that is the clothes you will find in their shops. I will say that most African fashion designers looking to make a name for themselves fall in this category.If I was a designer this is the route I will Choose. Mass production is basically when companies like H&m creates sample clothes and send them to China, India or Bangladesh to be reproduced and cater to the needs of the consumers. The little difference between ready'-to-wear and Mass market in my opinion is that the Ready to wear designer usually show collections while the mass market do not. Its a way for everyone to access the latest trends without spending the big money. Choosing to mass produce your design can be very difficult for an African designer because we do not have the proper equipments to make it happen. If you are thinking about Mass producing here are few challenges you might encounter: The lack of skills and clothing production companies,Africans don't buy things made in Africa ( it hurt but its true), Financial issues ( how and where to find investors ). The key is to research, research, research. I would love to hear from you guys about perhaps companies that mass produce in Africa. I hope that you do your research before you decide to jump in the business of fashion. So where do you fit in ? This is an insightful article. I am interested to here what companies do mass produce in Africa as well. I am interested in starting an African inspired clothing botique, however I'm not sure where to start. I am located in the US and have seen several African clothing stores, but they are no where near coutoure or even modern. They are traditional outfits (which I love) however, I would love to see more people interested in African clothing an culture. Which means their should be more designs like what is displayed on this site in the stores. Shorts and rompers made out of African print, but at a decent price. I am looking to meet up with designers, manufacturers whoever can help me get this business started. I would also like to gain more knowledge before I begin this journey so I will be doing my research.